A recently completed project to replace meeting room tables and chairs at a Birmingham based corporate HQ office. 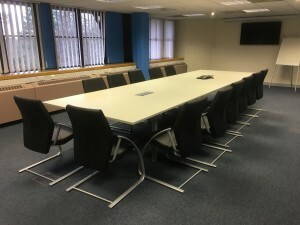 Carried out over one weekend, allowing to strip out existing furniture, clean and install new furniture including provision of recessed service modules, accessed via flip top lids, giving access to power, data, hdmi, vga and usb connections. New AV monitors were also installed in strategic rooms with cabling concealled in partition voids running under raised floor to relocated floor boxes.